On our bike trip northwards, we stopped at a lot of churches and cathedrals, not really for religious reasons but because old churches in England really are the keepers of local history. Usually they are the oldest buildings in town, and most thank goodness are still open to the public. And although they do have their ups and downs over the centuries, local people usually care a lot about their church, abbey or cathedral. Sometimes, in a town like Selby, Yorkshire, the church is such a treasure that I feel quite envious of the locals for having it on their doorstep. I had heard only vaguely of Selby Abbey, but when we finally cycled up to have a look, it was so interesting that I thought I'd share some of it with you. Rather than copying out highlights of its history, I'll refer you to the website here to read more about the abbey and the Three Swans of St Germain. In this post I just want to tell you about some of the curiosities that caught my eye. 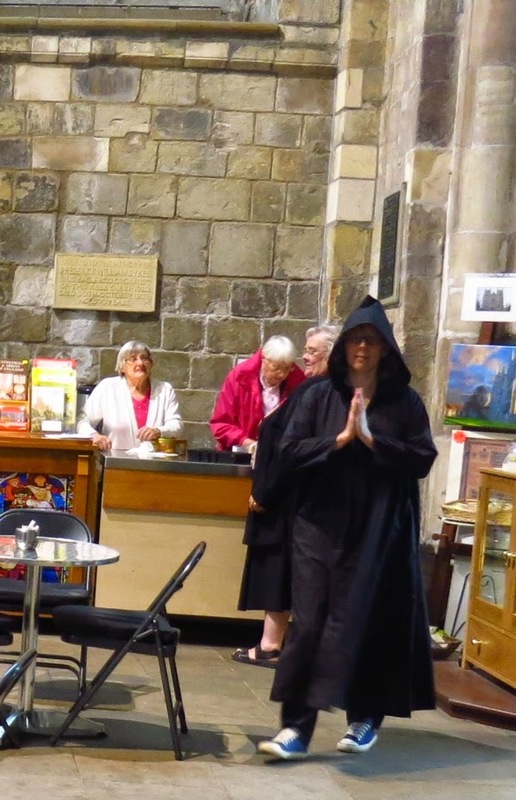 One lady was showing off her fancy dress cloak which she thought made her look like a monk. I liked the human interest in some of the memorials. 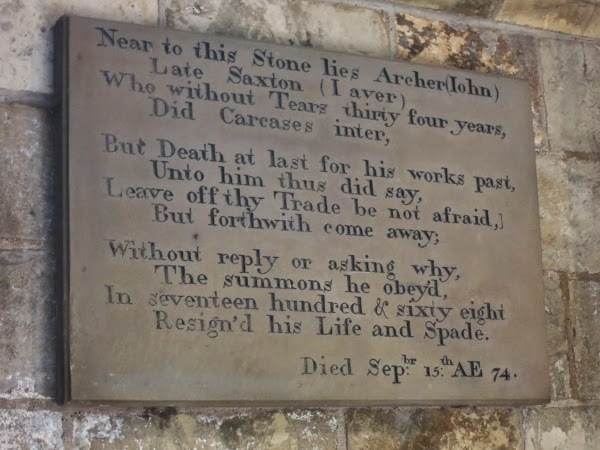 Can you imagine old John Archer, the gravedigger who patiently served the church by ringing bells and digging holes till he was 74, before setting down his spade and obediently answering the summons of Death himself? 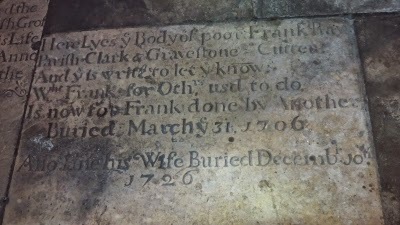 And Frank the gravedigger, half a century before John Archer, inspired someone to point out that "What Frank for Others Used to do, Is now for Frank done by Another." I hope you don't find it depressing to consider the lives of people who have died. I don't - I like to think that they are remembered. But there is more to see than memorials. 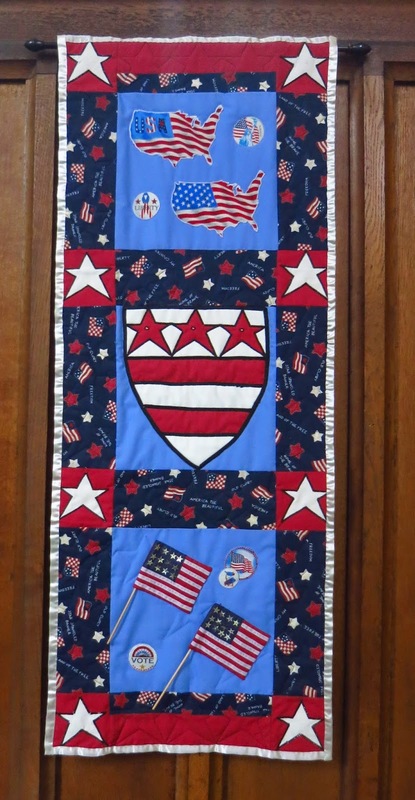 I was at first surprised to see a beautiful American quilt displayed as a gift to the Abbey from across the sea. 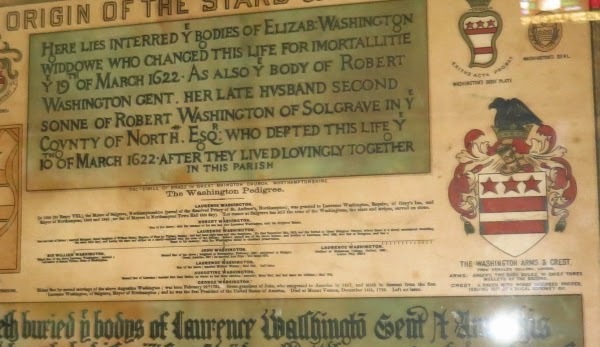 But then, I hadn't realised that George Washington's family were locals, and I have to say the family coat of arms looks as if it gave him some ideas of the flag for the new country. Quaint carving on the outside of the capital head too, mostly of wild creatures. 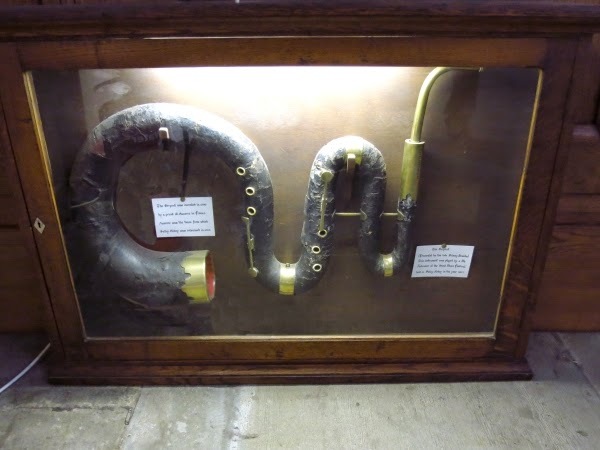 And one of the instruments from the abbey band has been preserved. It's a serpent, which was a mainstay of church bands in the eighteenth century, when most churches didn't have organs. I think the serpent sounds beautiful - like a sort of bass cornet - and it's rather a pity that it gone out of favour.With looks like that, it deserves to come back, don't you think? It probably drowned out the singers and other instruments though Here is what it sounds like. And talking of music, Selby Abbey by the way is running an appeal for its famous organ which is now in need of renovation. If you're interested, here's the website.to find out more about that. 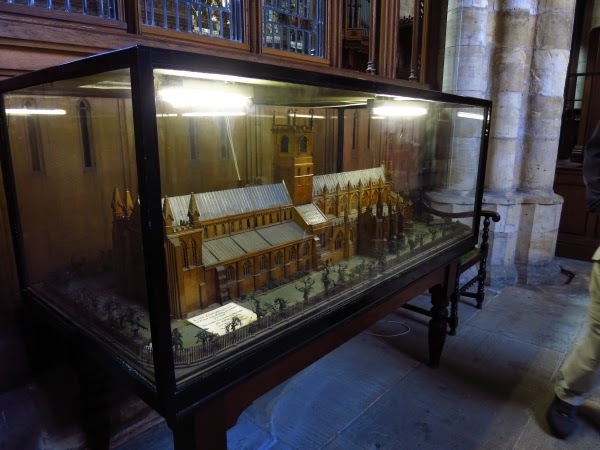 There is something touching about the idea of a parishioner sitting down and creating a beautiful scale model of the abbey, but this one is of particular interest because it was made immediately before the big fire of 1906. I hope you don't mind a few more memorials. Selby has some particularly good memorials to young men who died in the war - tributes that make them seem real to me. It was also good to find this very beautiful plaque to William Littlewood, who merely lived "a useful and unassuming life." As Milton said, sometimes "they also serve who only stand and wait." Well, you know me, I don't like to ramble on for too long and this post is already long enough. So here's one final image of Selby Abbey. It is part of the Norman structure, so it is getting on for a thousand years old. The abbey once had a central tower which collapsed. The parishioners must have suspected something was going to happen when they saw the wonky shape that the right hand arch was developing, right under the tower. It's all right now, though. Perfectly safe, and they don't have a tower on top of it any more. 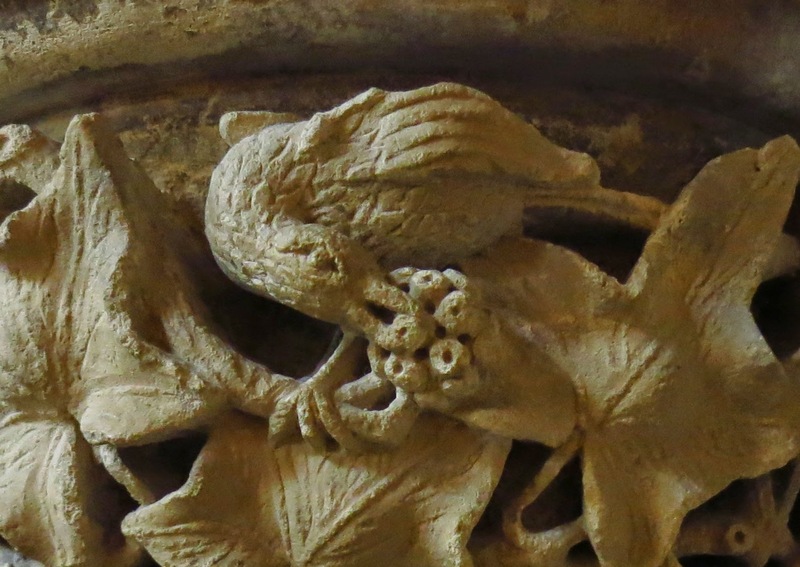 There is a lot more than this in Selby Abbey, which is halfway between Darlington and York, and I suggest that if you are in the area it is a good place to see. By the way we had lunch in one of those traditional Yorkshire tea rooms where you get big plates of delicious home cooked food, breakfasts, teas and light lunches, for reasonable prices all day. You can always spot them because they are always full of local ladies and families, they often have lace curtains and old fashioned chairs and tables, and are usually tucked down side streets. 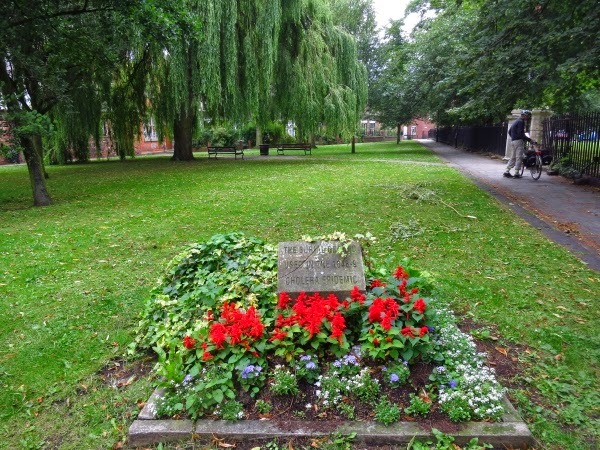 This is off St James Street, almost opposite the abbey grounds. Not a panini in sight and the lunches were not in fact particularly light, unless you think steak and kidney pie is light.. Okay, this is the third post this morning that mentions gravestone epitaphs. Must be something in the air. This is all so interesting. What a worthwhile adventure for all. Your photos are great, and it's like being there myself. All most. Then to end the day at a Tearoom, for me that's just perfect. Kick up your feet and sip some yummy tea! 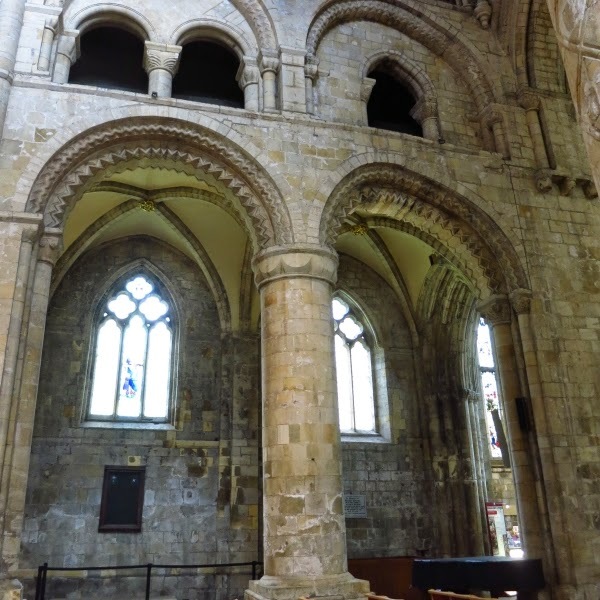 This was a lovely post, Jenny - you know how I like "all things Yorkshire", and as I have never been to Selby myself, I found it most interesting to learn something about the abbey. Like you, I like reading memorials. These were real people who died out of real lives, with real friends and families mourning their loss. Whenever possible, I visit churches and cathedrals etc., also less for religious reasons than for an interest in local history. But I must admit that some places have a way of deeply touching me in a religious way, even though I am confessionless and have been so for more than 30 years. It is something in the atmosphere of a church, the "lived in" feeling, seeing that it is well cared for and held in high esteem by its community. I remembered that Washington's family was originally from Yorkshire. 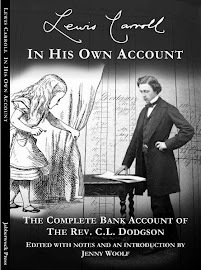 Two years ago, I read a biographical sketch about him. I love to visit old cemeteries and we have quite a few where I live. However, the oldest graves are from the 18th century as our history is but a few hundred years old. The Abby is beautiful and you gave us a very interesting tour. I love that there was life going on inside and it wasn't just a tourist place with areas roped off. It has a very long history, but it's story is still being written. Jenny, that's absolutely fascinating! What a wonderful place to visit. Such a lovely church - and what gems of memorials - plenty inspire any storyteller! Love it! I think the grave digger memorials are my favorite. European history is so very different than the history here, isn't it? And of course, people have lived here in Florida for many, many thousands of years, had their own cultures and civilizations but they were not the sort to leave huge monuments. The occasional flint arrowhead or spear point. A bit of pottery. Thank you for sharing this bit of history from where you are- it is gorgeous! We were in Selby a few weeks ago and they were having some sort of festival at the Abbey then as well. It seems to be a very busy church. Your approach goes to the heart of visiting such a place. It's many many years since I was there Jenny but, as so often with your posts, you have re-kindled my interest. I shall have to become a tourist in Britain again. So your posts really do achieve their purpose. What a great tour you gave us. I did not find it depressing, but rather found it exceptionally interesting and enjoyed the little stories. Thank you for the tour. Since I'll never get to your lovely country, this is the next best thing. Well, thanks for taking me on your journey. I learned so much. And I do love their tea. Thank you for this fascinating excursion to Selby Abbey - which I had never heard of. The photos are wonderful. I especially like the scale model of the Abbey - and the very unique serpent (it does indeed sound beautiful). What a lovely post. I can see why you found the abbey at Selby so fascinating. The quilt in honour of George Washington is interesting, too. And I love the memorial to William Littlewood. Any relationship to the Littlewood's dept. store in Southend? I wonder. I love the border to the memorial. Isn't it beautiful with it's inlaid stones and crosses? Beautiful pictures of Selby Abbey! A great tour. The picture of Edward VII was particularly pleasing! Graveyards, tombs, and churches are favourites with me too, you can learn so much and see so many treasures. The same also applies when visiting other countries - consider Père Lachaise, Paris, it is like having a free pass to the most wonderful outdoor sculpture gallery. Love the abbey, and the sound of the serpent! Such beautiful and sad memorials, they often made me wish i had known those people. Now it makes me look more closely at the people i'm with every day, and think about what their lives really mean, when i see such inscriptions. I enjoyed reading about the history of this beautiful abbey and found your pictures fascinating. It boggles my mind to think you can just wander through a thousand year old building. I thoroughly enjoyed this post....to see such a super place through your eyes! The Abbey is of beautiful architecture Jenny and everything is far too fascinating to be depressing in any way! You are so right visiting Churches is a walk through history. Australian Churches are quite young by comparison. Steak and Kidney pie sounds just the thing to finish up such a wonderful outing! Thank you for all the interesting comments. Rita, I think that hearing about others' lives is part of why I like to go round old churches, you do get a glimpse into history. Stephen, this was my feeling as I watched the little kid play around Selby Abbey, she is lucky to have a wonderful place like this in her community. What an interesting thought, Mimi. I had not thought of the people surrounding me in this way. Pixel Peeper, I think the door might have been for grain or something, looks to me as if that building had been light industrial storage. Rosemary, thank you for the suggestion about Père Lachaise. I hadn't known about it. Chickadee, I think the name is quite common, so if there had been a link with the business, I think they might have mentioned it. There used to be a large department store chain called Littlewoods but I guess it was taken over. Adullamite, I was hoping someone would comment on Edward VII it is a wonderful statue considering it's only about an inch or two high! Jon, I also liked the model, it was a little bit out of the way in the church and I wished they would give it more prominence. Meike, I thought of you and Yorkshire, and I exactly share your feelings about the impression that such places make - there really is the weight of spirituality about them, but practical spirituality. MsMoon when we visited friends in FL he had an indian mound in his land and I found it awesome thinking about the generations of people who lived unrecorded lives. Marilyn (I think that is your name - I am bad on names : "Starting Over..." and also AJ, I too really like the fact it was a working church and really felt active. This is one Abbey I haven't visited. The architecture is wonderful. Were the tablets on wall or floor? I have seen both but for the sake of my neck I prefer the ones on walls. Thank you for this really interesting post, Jenny. True, old churches can be not only breathtaking to look at but interesting sources of local history. I like the way the gravediggers have been remembered as well as the local bigwigs. 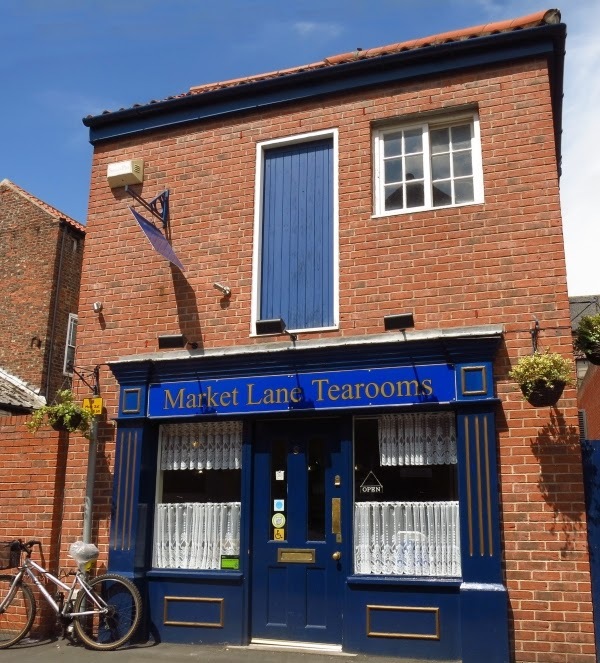 The building with the tearooms looks like an old warehouse, with that door on the top floor. I agree, those little side-street tearooms and cafés can give you a great old-fashioned meal free of all the trendy and expensive nouvelle cuisine. Just stop to say hi! You had a gorgeous trip! I apologize for a long absence. We recently surprised everyone and moved to Washington DC. So the past few months have been of packing, settling business in the West Coast, unpacking. I am glad to get on now with the more fun stuff of exploring and connecting with friends and family. I love this old abbey you discovered and all the secrets held within those stone walls. Interestingly, I was spending a lot of time near the National Cathedral here in DC and found myself slinking often around the perimeter, admiring its Gothic structure (though it was only built in the style of, not during the time of). I finally got a ticket for a behind-the-scenes tour which ended up being a private one since no one else signed up. 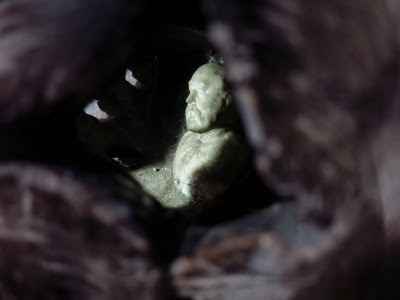 One of my favorite things was exploring their attic, which held all sorts of curious things like gigantic plaster casts of Christ, of 3D models of the cathedral. I also loved going out onto its rooftop, by the bell tower. There, you could see how naughty school boys from the St. Alban's school next door had snuck up through the years and graffitied the roof! Let me know if your travels take you to the DC area sometime. It would be so much fun to walk around the various neighborhoods and see your take on it! Lovely to have you back commenting again, Jenny. I have missed your remarks which are always interesting. I'd love to meet if I am ever in DC. 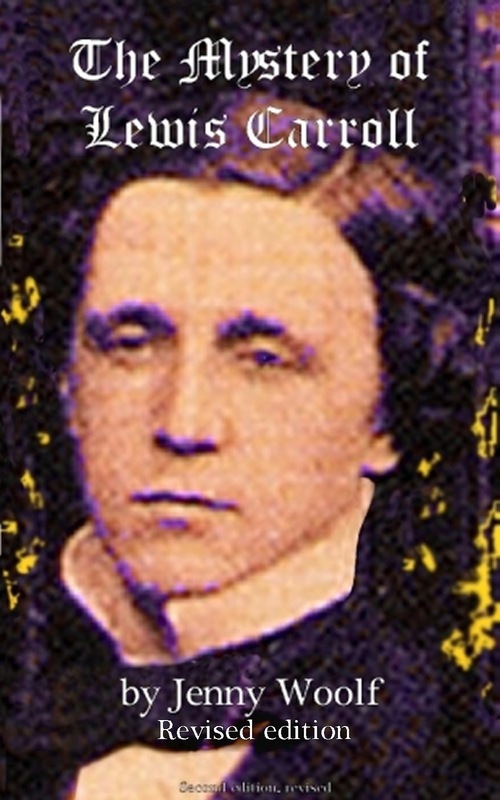 Bill, many of the graves outside had been cleared. We had to move on after looking round the abbey so I didn't get the chance to hunt down graves. Your posts make me long to visit England again. Fascinating! Lovely and interesting photographs of this remarkable abbey, Jenny. How far did you have to bike to reach it from your starting point? Wow there's a lot of good stuff to read and see in this post. I haven't eaten in a local tearoom for years, but there is something unique about them. Just like being on the set of Last of the Summer Wine. The abbey does look beautiful and interesting. I'm not a great fan of history but you made it all sound fascinating! 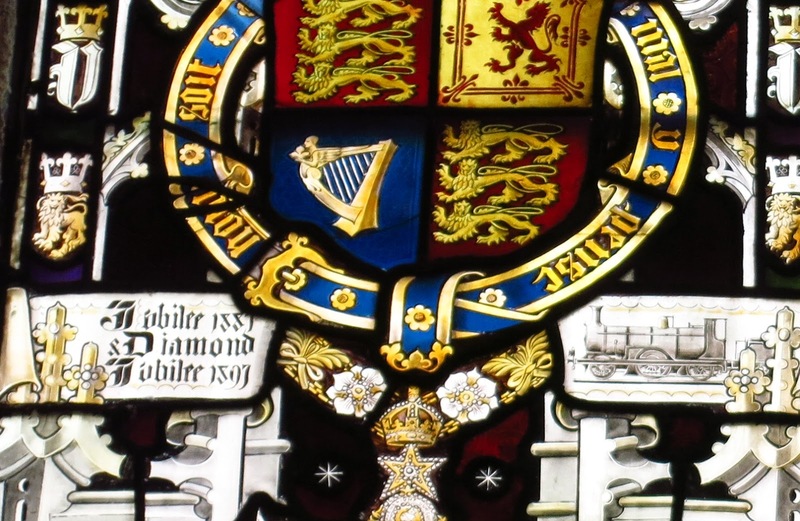 I enjoyed reading about Selby Abbey and found the memorials interesting. They tell us a little about another time. You always seem to find the perfect out of the way place for tea or lunch. Thank you to everyone who has left further comments! Such a nice compliment, Lee, thank you!. Teresa, you know I am not sure how far we biked, I didn't count. A couple of hundred miles I think, which is not far, when done over several days, but we DID stop off for a long time in some places! Thank you for sharing your knowledge and wisdom. I feel so well traveled. I could spend A LOT of time in places like that. You always seem to visit the most interesting places and I thank you for sharing them with us. I wish I could take that tour too. Those memorials are pretty cool with all of the history they include. It looks and sounds great (and a teashop to boot). I almost pass Selby on many journeys I have to make - now I know to make a detour next time I'm down that way. I enjoy a good memorial. Considering lives past gives a much-needed perspective to the present. I would be happy with an epitaph that said my life was useful and unassuming. Those are virtues that should be celebrated more often. I’ve visited many churches and Abbeys in my time, but somehow Selby was missed off the list. What an interesting place it is. 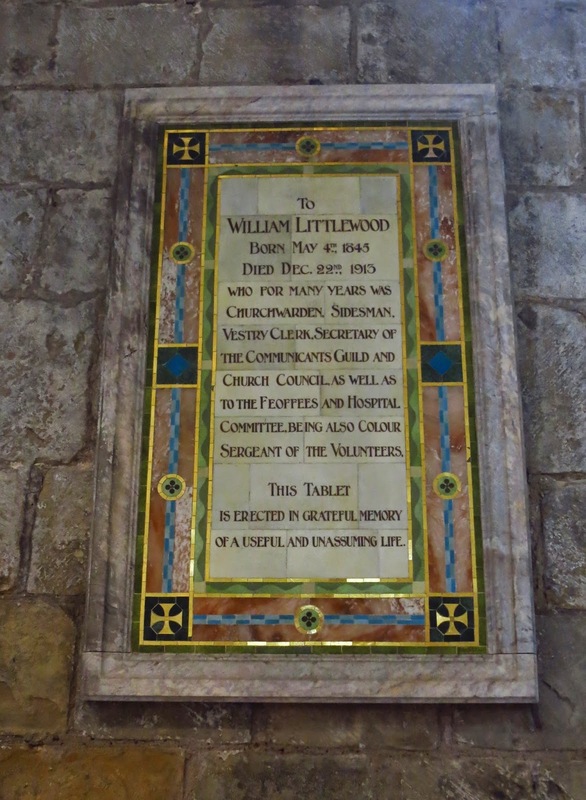 That simple memorial tablet to William Littlewood is very moving. I enjoyed the tour. What a beautiful church/abbey. This one would be well worth the visit. I love the memorials. 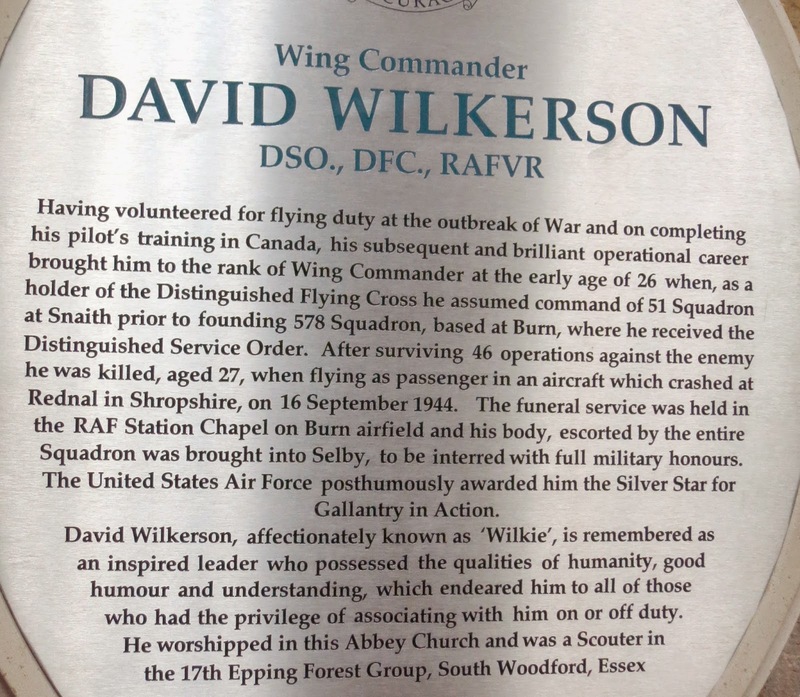 In fact, I'm very fond of visiting cemeteries and the like -- they fascinate me, the words on the stones or in this case the memorial plaques. I'm glad you shared them. You are right -- they deserve the remembrance. You re quite right, these old parish churches are a repository for everything local whether it’s general or particular history. They tell you so much about a place that you would never otherwise learn. You cycled in Yorkshire, uphill and down dale? Did your legs ache at all? I've never been to Selby so that was a lovely visit, thank you Jenny. And to top it off with a tearooms where there was not a panini in sight - that is Heaven. I love gravestones and memorials and usually spend ages reading them wherever I come across an interesting church or abbey. Sadly quite a lot are now locked over in Lancashire and Cheshire. And thank you for the serpent music. I had heard of serpents but had never heard one perform before. Somehow I have never been to Selby. Right, it is on the list now. Thank you! I’m so impressed by the architectural beauty of the Selvy Abbey. I suppose it would be the center of the local community. You stopped by for not religious reason but for its history. Likewise, we visit temples for its history, gardens or stillness not particularly for religious reason but either religious or not, almost every person puts palms together to pray. How about you? Anyway, your writing is enjoyable to read and cycling tour, parishl church, and that restaurant with lace curtain sound very British. Oh what a treasure of a place! I love the George Washington connection. One of the best things about England are the old ghostly buildings, and the smells... England smells old... I love it. And I love all of these photos, I hope you have a great upcoming week. This was a most entertaining post! Your photos are wonderful, and the history is fascinating. I would like to know where the name of the town came from. Do you know?